Barely 21 hours after a Lebanese man, Abdul Aziz Dib, 40, a car dealer who lives in the US but resides in the Coney Drive area when in Belize, was murdered — shot six times in the head and chest at close range by a lone masked gunman at approximately 12:30 p.m. in a restaurant — another Lebanese man has been executed. The owner of JEC Jewelry and Pawnshop on Youth for the Future Drive, and Mega Bingo, Alfred Shackron of a West Landivar address, died on the spot when an unknown gunman shot him multiple times in front of Body 2000 Gym on Coney Drive at about 9:30 this morning. Shackron was walking to his vehicle after coming from the gym. The gunman fired about four shots at him at close range, killing him almost instantly. One of the bullets went into his throat and came out behind his head. 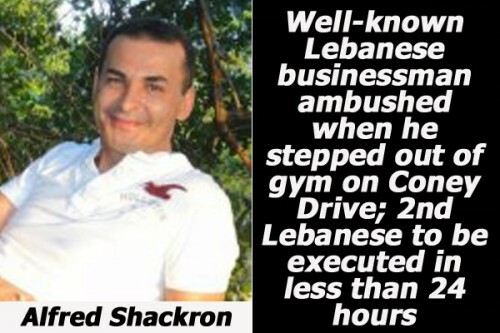 A witness told Amandala that Shackron had just come out of the gym. His vehicle was parked across the road from the gym. As he stepped onto the pavement after descending the gym’s stairs, a black car came speeding down Coney Drive from the direction of Princess Margaret Drive, towards the Canaan High School. The car stopped in front of Shackron, and an unknown person out of the car fired four shots at him, and when he fell, the car continued down Coney Drive. A person who was in the area at the time told police that a vehicle drove up and stopped in front of Shackron, and that the occupants of the vehicle had a verbal exchange in their language, and then one of the men from inside the vehicle attempted to drag Shackron inside their vehicle. Shackron, the person said, yelled out for help, and a gunman from inside the vehicle shot him in the left side. The men then came out of the vehicle, and one of them shot Shackron in the neck and chest area. The vehicle then sped off towards Buttonwood Bay. The eyewitness also mentioned that another vehicle pulled up and three men came out and looked at Shackron’s body on the pavement, and then they drove away, also towards Buttonwood Bay. When the police came, after about ten minutes, they put Shackron in a vehicle and rushed him to the Karl Heusner Memorial Hospital, but he was declared dead on arrival. Those who saw him said that the fatal shot was the shot that went into his throat and exited from behind his head. One of the four shots, they say, went into a nearby vehicle, damaging its right rear wheel. Shackron had many businesses in the city, besides the JEC Pawnshop and Mega Bingo — including Sunrise Apartments, among others. Alfred Shackron lived in Belize for over 16 years, and he is the former husband of community activist and PUP aspirant in the Lake I division for general elections in 2012, Yolanda Rodriquez, who is also the founder and director of Belizeans for Justice. She wonders, she told reporters, when the senseless violence will stop. She said that even though they were divorced, she and her ex-husband had remained very good friends, and talked almost every day concerning the kids. She said that she stood up and spoke out against violence, but now her children are fatherless, like so many others whose fathers have been killed. Alfred Shackron is survived by his two children, his first wife Yolanda, 51, and his second wife, Vena, 32. Police are seeking the public’s assistance to solve these two murders — that of Alfred Shackron and Abdul Aziz Dib. Individuals with information that can help police are urged to call the nearest police station, call 911 or Crime Stoppers at 0-800-922 Tips.